My son Tyler, just by being, has been and continues to be a catalyst for helping to release my special (conditional) relationship with him and thus with all my special relationships. And in so doing, return us to our truth in holy relationships. An essential part of my deep awareness now, is that every person within my close circle of family and friends is an equal spiritual being with each unknowingly expressing their level of belief in separation from God. As I’ve come to a deeper understanding of Jesus’ teachings through A Course of Miracles, Nouk Sanchez’s The End of Death, and The Way of Mastery I am beginning to learn that our (the ego’s) version of unconditional love as a loving and caring parent for our children is just an expression of our belief in the perception of separation. All concern, worry, pride, and protectiveness is a denial of our perfect safety, wholeness and innocence as God’s creations. In the dream we may appear to care, yet this care is not an expression of God’s love. When we express concern and worry for our children, we are arguing with God that they are not safe and we know best, not God. When we express pride in our children’s accomplishments, we are arguing with God that they need our approval to feel good about themselves. In other words, we need our children to feel good about ourselves. How could this possibly be true? We are always using these special relationships to reclaim God’s love, which we mistakenly think we lost. We project our fears in order to get something from someone to feel better about ourselves or to show God we are worthy of her Love. God’s unconditional love for us needs nothing because we already are Love, created in Love, abiding in Love and expressing Love. That is our reality, not the small love of the ego, which needs to get something from someone to feel happy. Jesus says that these special love relationships are actually a form of hate. Wow, this is a tough one for me. My role as mother has been my greatest; most protected and cherished role. I have used the role to define myself as a loving woman who cares and will always love and support her children. One of my strongest beliefs is that the sole purpose of family is always, always to be there for each other no matter what happens. When I tell my children that I will not let them starve, that they will always be cared for, I mean it. How can this possibly be a form of hatred? I find it helpful for understanding the perfect innocence and safety of all of us to review the process that guided me to this beginning awareness of our total innocence and safety. Tyler was diagnosed with one of those labels that threw my role of protective, loving mother into over drive. It also opened my heart to seeing all children with labels as whole and perfect in God’s eyes. 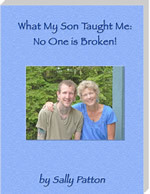 Each time Tyler was hurt, he showed me that my worry and anxiety did nothing to help him. He always bounced back into his radiant self. Once in a deep meditation, a giant-sized owl appeared and told me that she wanted Tyler to fly with her and Tyler very much wanted to go. Yet, he could not because he was tethered to me with a large rope. I frantically tried to untie then cut the rope. As tears slid down my face, I finally managed to cut the rope and Tyler got on the owl’s back and flew, giggling all the way. I asked the owl why I could not also fly and she said that I was not ready. So the symbolic cutting of the umbilical cord when Tyler was seven years old was deeply healing and while I was not consciously aware in the way I am now (I was not ready yet), it was confirmation of his continual safety and innocence as an extension of God’s love. It was my special love for Tyler that was holding him back. I wrote in one of my newsletters over twelve years ago that I watched Tyler’s radiance slowly fade under all the negativity of society’s views that children with labels needed to be fixed. He slipped into deep depression in high school and started cutting himself. While I was barely a Course student at the time, I had already developed a strong belief in Tyler’s ability to heal himself. I felt an unshakeable faith that any form of worry was not helpful and this stayed with me even when Tyler cut “help me” into his arm. Would it help Tyler for me to worry and take on his misery? All that gets you is two miserable people. My guidance was to take him to a spiritual counselor who specialized in “indigo” children. And, within the year Tyler came out of his depression more centered and at peace within himself. Once again I received a powerful demonstration of Tyler’s complete safety and innocence. As adults in their twenties, both Tyler and my daughter Sarah continue to challenge me to let go and trust in God’s all encompassing love. Tyler has become a tattoo artist and is a walking demonstration of his art. When he started getting tattoos at age 18, I was OK with it until he started to cover his entire body. I have had to let go of my expectations of whom I thought he should be and look like. Little by little I let go to allow him to be whoever he wants to be. I remind myself over and over again that Tyler is a spiritually centered, kind young man whose holy self shines very brightly and that’s all that matters. And every time I think I’m done with letting go, something else comes up. It’s time for me to fly without the burdens and expectations of the special relationship of being a mother and wife. It’s time for me to accept fully my innocence and safety. It’s time for me to remember that I am Christ, to embody God’s love, to see past the veil of separation to knowing everyone’s innocence. It’s time for me to let go of all attachment to being a mother and wife. It’s time for me to let go of my need for Sarah, Tyler and my husband Rick to act a certain way in order for me to be happy. It’s time for me to completely set them free, to make no demands on them and to not seek approval in any form. To know within the depth of my being that Sarah, Tyler and Rick are shining creations of God and are one with God, safe in their holiness. And, to love only the Soul they truly are. All else is the illusion of separation I’ve chosen to temporarily believe. And in so doing, I do it for myself and for everyone. Next blog post will explore what we think we’ll lose and our concerns about what people will think when we let go of special relationships. I provide mentoring through Take Me To Truth Inc . Thank you so much Sally. This is extremely helpful for me and my own role of letting go of my son. My son is in his early twenties and has had a struggle with depression anxiety mood disorders off and on most of his young adult life. I find myself the most miserable when I am identified with his pain and my own feelings and frustration as a parent to help him. I want to set him free and thereby set myself free from this burdensome notion of Mother Love. Thank you for the post that shared the details of your journey with learning to let him go with the help of a wise owl.